Angie was one of those rare brides where I felt like we “clicked” even before we ever formally chatted on the phone or met in person! 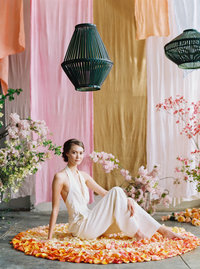 From the beginning, she let me know that her wedding day priorities were 1) putting together a natural, intimate experience for her fourteen guests and 2) targeting beautiful lighting for her wedding photographs. 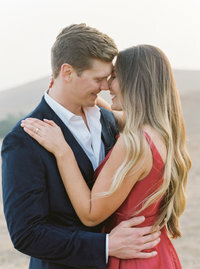 Her initial email echoed my own personal wedding planning experience so well that I knew even though I’d be meeting Angie and Stephen for the first time in-person on their wedding day, it would be like greeting old friends! The Meadowood resort space is set in Napa Valley, surrounded by hundreds of family wineries and incredible views. I could feel the excitement in the air as soon as I stepped into the sunny glen space and saw those sweet rows of chairs and Valley Flora‘s beautiful arrangements. Angie and her mom got ready together at a cottage nearby – can you believe the bride did her own hair and makeup?! We hopped into a golf cart shortly afterwards and zoomed over to a little walkway in the woods, right above the private ceremony space. There, Angie and Stephen had their first look, joined by Stephen’s son London, who had the BEST reaction to seeing the bride that I think I’ve ever seen!! I couldn’t have picked a better setting for Angie and Stephen’s couples portraits. The sunlight filtering through those iconic wine country oak trees made for the prettiest images, and I love how bright and romantic Angie’s wedding day florals looked against the woodland green. After a loving ceremony service, backed by some magical harp music, we celebrated with group photos, a delicious cake cutting, and a cheery champagne toast before hopping in the car and driving over to The French Laundry for the dinner reception. For those of you who don’t know, The French Laundry is one of Chef Thomas Keller’s restaurants and one of the most exclusive, well-awarded dining spots in the Bay Area! There’s a really striking wall in the courtyard of the restaurant where we finished up our portraits against the Japanese maple trees there. Can you tell I really like trees?! I’m so in love with this wedding and hope you all enjoy the photos! Congratulations again to Angie and Stephen, your day was incredible and I’m so thankful to have been able to capture it all.